An event that can be anticipated to a certain degree, but is considered unlikely to occur and may have a sizable impact on the valuation of a security or the health of the overall market if it does occur. A grey swan event is unlike a black swan event whose total impact is difficult to predict. Despite the possibility of determining the properties and potential impact of such an event, it is difficult to create precise calculations regarding the total impact. 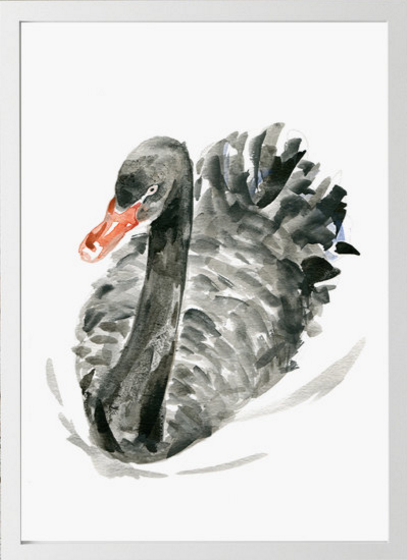 The term “black swan” was coined by Nassim Nicholas Taleb to describe the uncertainty and risk posed by unpredictable events. Grey swan events, which are derived from the black swan concept, may include earthquakes and even events like the Great Depression. While analysts can look at the impacts that similar events had across history, the exact extent of damage and risk cannot be calculated. This important update comes at a moment of great planetary flux and unparalleled transformation of the human race. In fact humanity right now sits on the cusp of an unprecedented revolution of consciousness. Every continent and nation, every city and state, every community and family, and every person on the Planet is undergoing an unmatched set of challenges. No matter who or where they are, each individual will soon face a Perfect Storm of events the likes of which has never happened in world history. Some have even referred to it as the “Pluperfect Superstorm”. This coming Superstorm is not to be feared or avoided as there is no escape; rather, it is meant to be engaged with the heart of a spiritual warrior that is at once full of courage, trust and resolve. Even though there have been other races of humanity before the present one, each has its own unique process of evolution and collective experience. What the current race is about to experience will be nothing short of earth-shaking and paradigm-shattering, since that is what is now required for the upcoming leap in the evolution of consciousness. As we look around the whole planetary realm, one sees nothing but the harbingers of massive change and transformation. With this understanding: that “true prophecy is uttered to avert catastrophe, not predict it”, this critical moment is an excellent time to take stock of where we are … as an individual, and as a collective. For it is the prevailing state of the collective consciousness around the planet that will ultimately determine the outcomes, big and small. Each of us belongs to a number of different collectives. We belong to a family as we belong to a nation. We belong to our religious organizations and spiritual groups just as some belong to a small company or large corporation. Some can claim membership in many collectives; some but a few. The crucial point here is that the collectives which influence us at this time can do so with great benefit, or with awesome consequence. Therefore, it has never been so important to get right with GOD, or whoever your Creator might be at this pivotal moment of human history. The times approaching will be fast and furious indeed, and every soul on Earth will be best served by their connection to the Almighty. For it is only through right relationship with the Supreme Being that every human being will be able to navigate through the coming Superstorm. Because the most consequential prophecies of old, and predictions of recent times, are about to be fulfilled. One prediction in particular has to do with what is known as the Super Shemitah. This website has written and posted extensively on this periodic phenomenon which comes from the Judaic tradition. 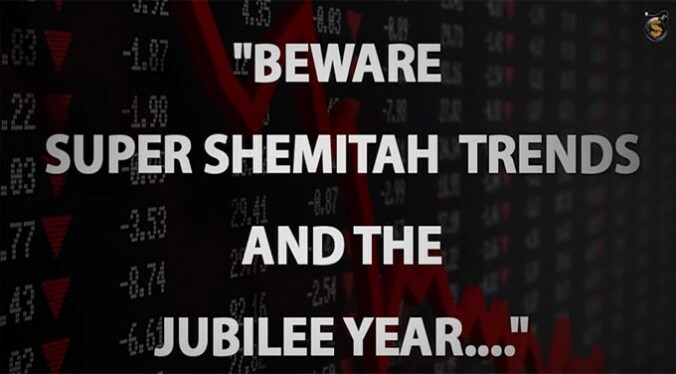 The current year — 2016 — is known as the Super Shemitah, also known as the Biblical Shemitah Jubilee. It specifically runs from September 23, 2015 through October 2, 2016. This year, then, is a very BIG deal. As a matter of fact, it does not get any bigger than the Super Shemitah. 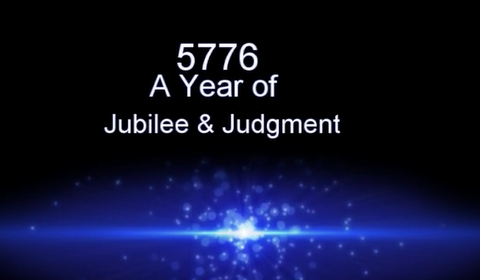 That’s because this year is also the 70th and some say the 120th Biblical Shemitah Jubilee. That means it marks the end of an approximately 3500 year cycle and/or 6000 year cycle within the Judaic tradition. This makes for a super-charged year of tumultuous and turbulent transformation. The current U.S. presidential election and campaign season is a perfect reflection of the energies which predominate during every Shemitah year. Only this year it is the Super Shemitah — a Shemitah on steroids. This short essay is being written in anticipation of a global event(s) which may very well trigger a series of domino events that can profoundly alter the Global Economic and Financial System (GE&FS). Because the whole world is hardwired according to the same basic financial foundation and economic architecture, what happens in Italy can reflex over to India. What occurs in Russia can deeply affect the Eurozone. When the lights go out in the USA, Canada and Mexico will also be impacted. The present GE&FS is very close to a critical juncture. It has recently evolved devolved into a highly destructive form of predatory capitalism WHICH IS COMPLETELY OUT OF CONTROL AND UNSUSTAINABLE. As a result of now being in its death throes, the primary purveyors of predatory capitalism (as well as disaster capitalism) are often seen thrashing around the planet in a last-ditch effort to prevent the final collapse. All the experts are fully aware that the GE&FS is not far from its terminal breakdown. In other words there is now a mathematical certainty that it is only a matter of time — a short period of time — before people everywhere witness the pervasive destruction of the GE&FS in real time. The MOEDIM: What is it exactly and why is it so important now? The MOEDIM speaks directly to those prophetic signposts and divine appointments which never change, as they are foreordained by the heavens and written in the stars. Each of the 3 remaining signposts is upon us. According to many religious scholars and historians there is every reason to believe that “the end is nigh”, which really translates to the conclusion of various 6000-year plus calendars and, therefore, the termination point of the current order. The final outworking of the MOEDIM speaks directly to this eventuality. Why was the Judaic faith tradition chosen? Many ask the question as to why the Hebrew calendar and Judaic tradition were chosen as the foundational blueprint for so much of what goes on in the world. As a practical matter, the several diasporas which the Jewish people have experienced over millennia have seen to it that they are domiciled in virtually every nation on Earth. Not only that, but they are trained and acculturated to rise to the top positions in society wherever they live. This fact alone has put many of their own in positions of great power and influence in every sphere of life. There are other reasons why the Jewish race was ‘selected’ to be the Chosen People. Simply put, they were chosen to run the place, which they have done in an extremely clandestine manner over many centuries, because it was their destiny to do so. It has already been acknowledged that the entire civilization operates under the rubric of a global banking system that rules the day—everywhere. Even those few countries that do not subscribe to the dictates of GE&FS controllers are held hostage by them. There’s really no escaping the global monetary prison that has been fastidiously constructed from time immemorial. The final point here is that the international banking cartel was always staffed by Jewish bankers because they were the only ones charging interest. The religious prohibitions to do this in other religions guaranteed that global banking would essentially have a sole proprietor, even though it may look like there are many. This single dynamic allowed them to create a worldwide money monopoly by which they came to exert total financial control over the business of the whole world. The Rothschilds and Rockefellers, Goldmans and Sachs, Warburgs and Schiffs are all banking families who represent this multi-generational pattern of bank ownership and control. Which brings us back to the Grey Swans. There are now so many Gray Swans flying around that it’s difficult to keep track of them all. In fact it’s a bit like tracking space junk. The list of trackable objects is growing daily, while the capacity to do so competently is diminishing! Even one Gray Swan like Deutsche Bank, or Japan, or Syria, or the European Union (remember BREXIT), or China, or Saudi Arabia or another 9/11 terror attack can swoop right down out of nowhere and trigger a global event in its own right, or trigger a much larger domino effect that would cascade throughout the global marketplace. The following video graphically portrays how just one such event could change the world forever. Now for the current list of Gray Swans, as per the intelligence briefing platform DEEP CONNECTIONS. The true state of affairs across the entire planet cannot even be written down on the alternative news websites. Were the truth to be known, very few would even get up in the morning, much less go to work. Hence, there is now a dire need to make things right in the world of men. That can only be done when a critical mass of collective consciousness so wills it. That time is now … or at least getting closer by the second. The very purpose of so much trial and tribulation, pain and suffering, agony and adversity is to get the people to move. Most will sit in their insufferable status quo even though the whole house is falling down around them. The signs and omens have been many and numerous, diverse and various. And, yet, folks have been quite content to sit in the stench of so much corruption and degeneracy. The apathy to the plight of foreign peoples and indifference to the predicaments of people next door have precipitated the need for a cosmic reality check. Because so many have steadfastly taken the path of least resistance, a sea change is now necessary to initiate the urgently needed changes to simply exist with dignity and basic subsistence. As a result of the reality that so many refused to get it when it has been so obvious, this tract of humanity will most likely get busted upside the head with a four by four—a very divine 4×4, of course. That’s where the Super Shemitah comes in. Especially when it occurs during the Chinese Year of the Red Fire Monkey will there be much drama along with a huge display of fireworks (See the upcoming debate between The Donald and Hillary). How else to get the attention of the place except by staging what is about to unfold on a screen near you: “The Greatest Show On Earth”. Now the $64,000 question is: Are you ready to play your part? Because everyone has an important role, even though each and every player is also in the audience. In this way we all get to watch and play so that we can contribute our best to this rapidly unfolding and incomparable production of the Third Millennium. At the end of the day, or in this case the end of the era, all that really matters is how we respond to the events that are soon to take place. At this late date there is truly very little that we can do to affect what will happen; however, we can always change our attitude toward any given eventuality. This is the most distinguishing aspect of human free will. Each of us is gifted with the freedom to react mechanically to any happening, or to respond thoughtfully to any event however we so choose. Herein lies the secret to addressing the inevitability of the Super Shemitah. The extent that we are stuck in the past or anxious about the future will hamper our capacity to act effectively in the present moment. The change that is surely coming is all good and for the highest good of all. Nevertheless, the birth of a new order does have its birth pangs. However, even birth pangs can be alleviated considerably with the right attitude and spiritual approach. Each and every Gray Swan that is now flying around serves a vital purpose in the unfoldment of the plan. The real plan is not a nefarious New World Order or malevolent One World Government, although those knuckleheads think so. Neither is it a massive depopulation program or climate change collapse. Rather, the divine plan is one that has been carefully designed for the highest good of each person. It is at once flawless, forgiving and formidable. And every soul has the right stuff to embrace it to the degree necessary to both survive and thrive during the coming catharsis. Truly, it’s all good. There is nothing that can go wrong. Everything has its own perfection. Even the obvious imperfections are really perfect in the here and now. That is the real challenge for the Western mind—to see perfection even in the gross imperfection of mundane life. To see perfection where it appears not to exist at all. The truth is that everything is perfect everywhere, all the time. It’s quite possible that October 2, 2016 (and October 3rd since Rosh Hashanah is also celebrated on that Monday) will come and go with little or no consequence. That does not mean that the relevant predictions will not occur; only that the timing is different. There is simply no averting the divinely ordained prophecies given the worsening condition of Planet Earth. The biosphere itself is in great need of a major rejuvenation, and only a radical change in the order can produce such a necessary cleansing.